Lassnr is a Nord barbarian located in his house in the Skaal Village. He is worried that his son Tymvaul is lost and asks you to enter the well just to the west of his house and go down into Rimhull to find him. He lives in a medium-sized house in the Skaal Village. On the right of the entrance, there's a table with the book Hanin's Wake, a Parchment with Scrawlings, a ghoul heart, a daedra's heart, a sample of the extremely rare wolfsbane petals, and a journeyman's mortar and pestle. Under the table, there's an exclusive fortify intelligence and above the table on a shelf, there's a sample of human flesh. On the left of the entrance, there's a fireplace and a table filled with clutter. In the back right corner from the entrance, there's a few bedrolls, a fireplace, a cupboard filled with clothes, and the book The Doors of the Spirit. In the back left corner from the entrance, there's a shelf with clutter on the top two rows, and the books Corpse Preparation v I, The Book of Daedra, and Poison Song II on the bottom row. On the floor around the shelf, there's a basket full of clutter, a fork, and the book Blasphemous Revenants. The only other item of note is a scroll of bloodfire on a support beam in the back of the house. He is wearing a pair of common pants, and he carries the Restoration skill book 2920, Rain's Hand and a key to his well. Aside from his natural resistance to shock, immunity to frost, ability to shield himself, and a natural frost damage spell, he knows no spells. Tymvaul in the Well: Lassnr! Tymvaul has fallen in the well! Voice: "My son... My poor, son... Please, please help a sad old man." "Tymvaul? Is that you, son? Oh..oh I'm sorry. Please forgive the ramblings brought on by an old man's anguish." "Uh, oh, yes %PCRace? 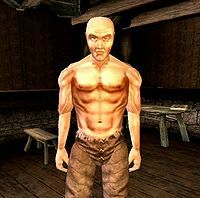 I'm sorry, I was just thinking of my boy Tymvaul...."
"My son, Tymvaul, was getting water, and fell into our well. I am so lonely without him. Ever since his mother passed, Tymvaul has been my only companion. The pool beneath the well leads to a series of ice caves known as Rimhull. So my boy may still be alive. But I am too frail to search the caves, and everyone else in the village is convinced Tymvaul is already dead. I must know if he still lives! Please, %PCRace, will you enter Rimhull and learn the fate of my son?" I'll help you, Lassnr. It's possible Tymvaul still lives. : "You...you will help me? Oh, thank you, %PCRace! Since my son fell into our well I have kept it locked, to avoid any more unfortunate accidents. Here's the key -- the well is out back. The waters of the well lead to Rimhull, but there is said to be a more direct entrance to the ice caves, somewhere outside the village. I know not where such an entrance may be, though it's probably hidden somewhere nearby. Now hurry! Return when you have news of my son!" "Please hurry, %PCRace. My son may still be alive, but he can't survive down there for long." "Please, %PCRace -- what news of my son Tymvaul?" "I thank you again for helping me, %PCRace. You came to my aid when no one else would, and for that I will be forever grateful." This page was last modified on 26 August 2016, at 00:49.